WARNING: This product can expose you to chemicals including Tris(2,3-dibromopropyl)phosphate, which is known to the State of California to cause cancer, and Toluene, which is known to cause birth defects or other reproductive harm. For more information go to www.P65Warnings.ca.gov. From Rogue comes this amazing deal in the RA-90 dreadnought acoustic-electric guitar with Road Runner RRDWA case. 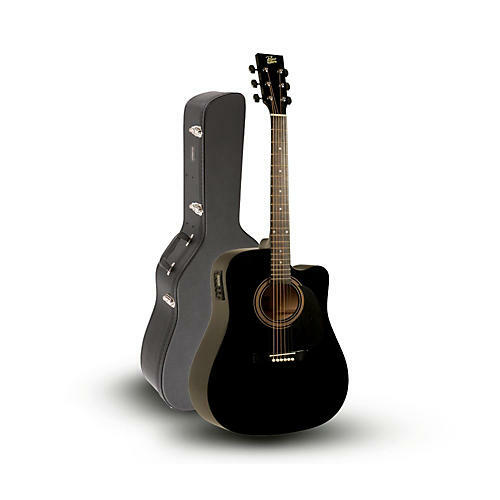 The Rogue guitar is an ideal instrument for the beginner, or young musician. The body depth and width bring out balanced tone and plenty of projection to be heard from across the room. This ultra-affordable dreadnought acoustic guitar features a whitewood body, which brings out lots of mid-range punch. The nato neck adds sustain without losing any strength in tone. The painted maple bridge and fingerboard add clarity to each note, and a striking look to the front of the guitar. The RA-090's C-shape neck, 1-2/3" nut width, and 16" radius help with intricate fretboard movements when running up and down the 20 frets. The RA-90 also features nickel hardware and covered tuners. This Rogue acoustic guitar will certainly get the job done, at a price that anybody can afford. This dreadnought case by Road Runner features strong multi-ply wood construction with Tolex covering. The valances are stitched through the case top and your guitar will be well kept in its soft, cushioned interior.